Woody Guthrie had died (after fifteen years of illness) on October 3, 1967, and, apparently at Dylan’s suggestion, plans were made to hold a benefit concert in his honor. 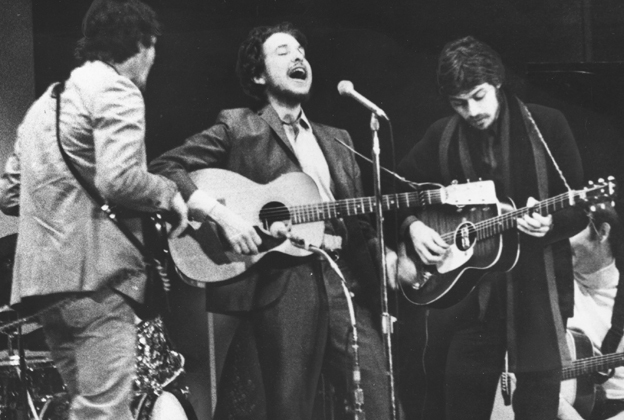 The concert took place January 20, 1968, at Carnegie Hall; Dylan appeared backed by the Band (other performers included Odetta, Pete Seeger, Jack Elliot, and Judy Collins), and played three Woody Guthrie songs: “Grand Coulee Dam,” “Dear Mrs. Roosevelt,” and “I Ain’t Got No Home.” These performances were later released on a Columbia album called A Tribute to Woody Guthrie, Part 1. Dylan and the Band are in fine form here – their performances are inventive, exuberant, and sublimely musical. The Woody Guthrie Memorial Concert. Afternoon show. Released on on “A TRIBUTE TO WOODY GUTHRIE, Part I”, Columbia KC-31171. At that rate, three concerts. Four perhaps; if there were 2 shows in California, that is. to perform beyond the confines of the limits is to become oneself…sublime in the face of the eternal source ~ what an awakening . . . . . . .
i) I am certain that there were 2 concerts, on the US east and west coast respectively, though I think that Dylan only appeared at the east coast one, as per above. 1-3 Bob Dylan (guitar & vocal), Robbie Robertson (guitar), Richard Manuel (piano), Garth Hudson (organ), Rick Danko (bass), Levon Helm (drums). 4, 5 Bob Dylan (guitar & vocal), Pete Seeger (guitar & vocal), Judy Collins (guitar & vocal), Arlo Guthrie (harmonica & vocal), Odetta, Country Joe McDonald, Richie Havens, Tom Paxton ,Jack Elliott (vocal). The Woody Guthrie Memorial Concert. Evening show. None of the tracks in circulation….